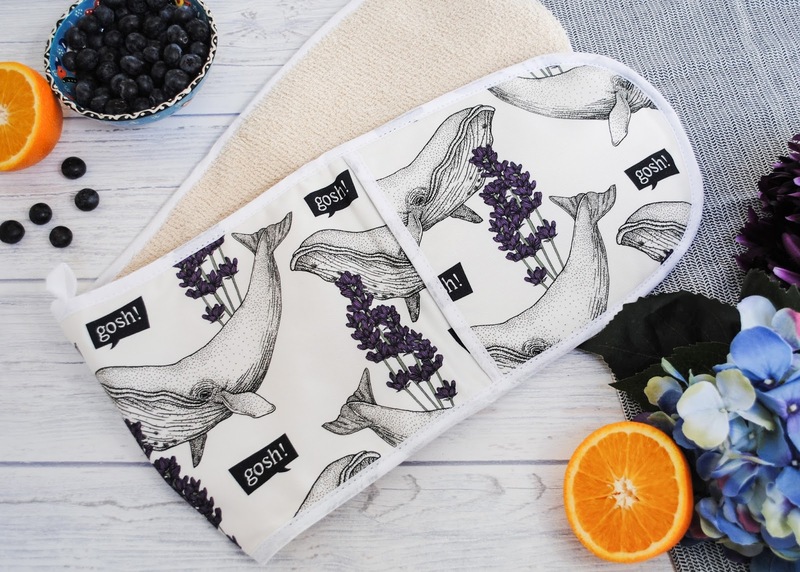 Here at Pig & Fig, an all female team of Wonderwomen work away to provide beautifully British designs to adorn your kitchens. 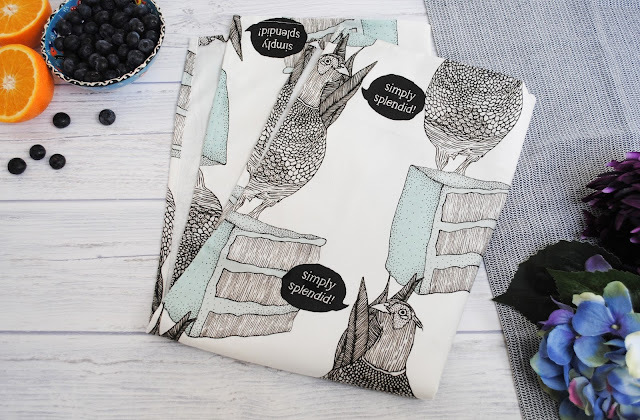 Mixing quirky with quality, we strive to bring British humour into the home, tastefully. As you know, all of our products are designed, made, manufactured and hand finished in the England, supporting other blossoming businesses – and we are super passionate about working alongside other Wonderwomen… cue the Sharkett Sisters. oo, we do love a dramatic entrance. The Sharkett Sisters, Imogen and Antonia, are a stylish Northern duo, who have documented their move down to London, exploring amazing food spots, chic fashion finds, delicious recipes, DIY tricks, they even infuse their own gin…need we say more? 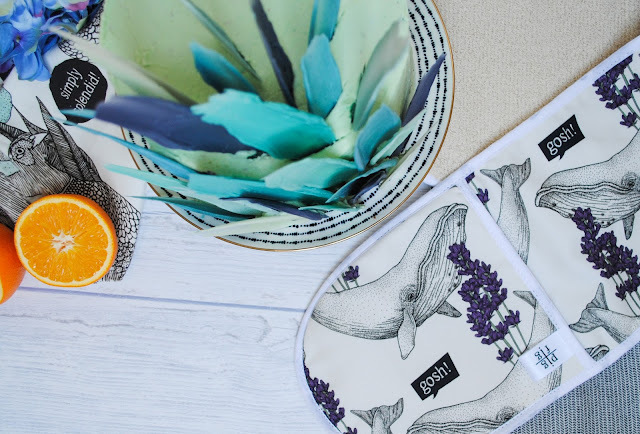 We recently got the chance to collaborate with an amazing new British brand, Pig & Fig. We absolutely love their cute and quirky designs, they definitely add a little fun to our kitchen! 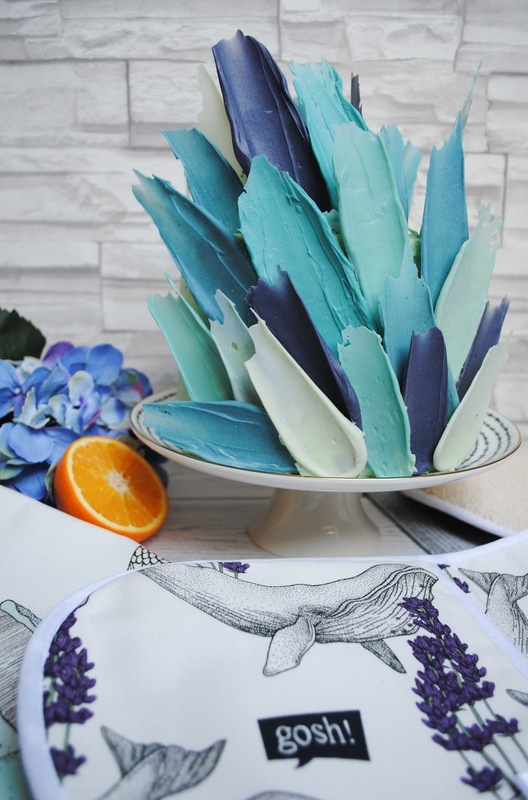 The beautiful designs are all hand illustrated, made, designed and manufactured in the UK. 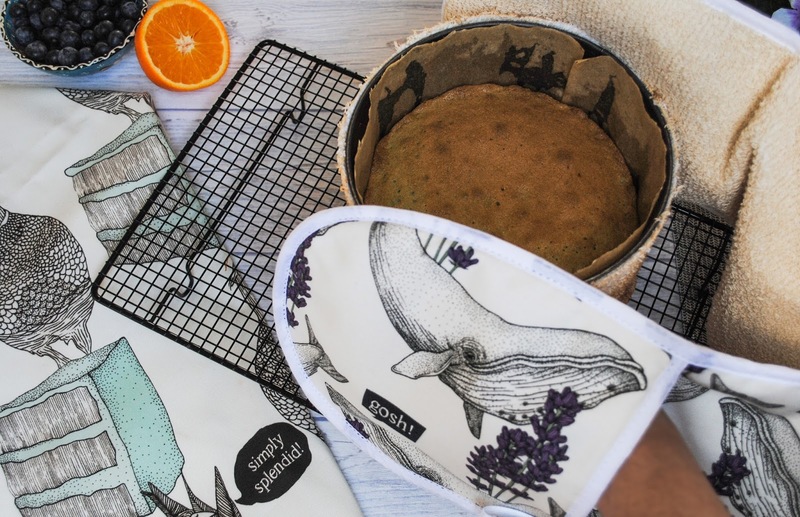 They sell their gorgeous prints on tea towels, aprons, oven gloves and phone cases and we want all of them! 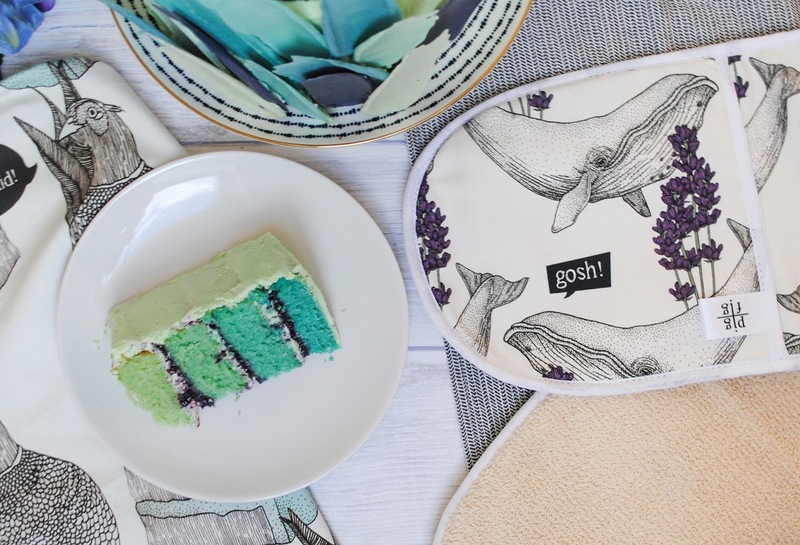 We wanted to make a cake to show some love for our favourite designs – Whale and Lavender and Pheasant and Blue Cake. 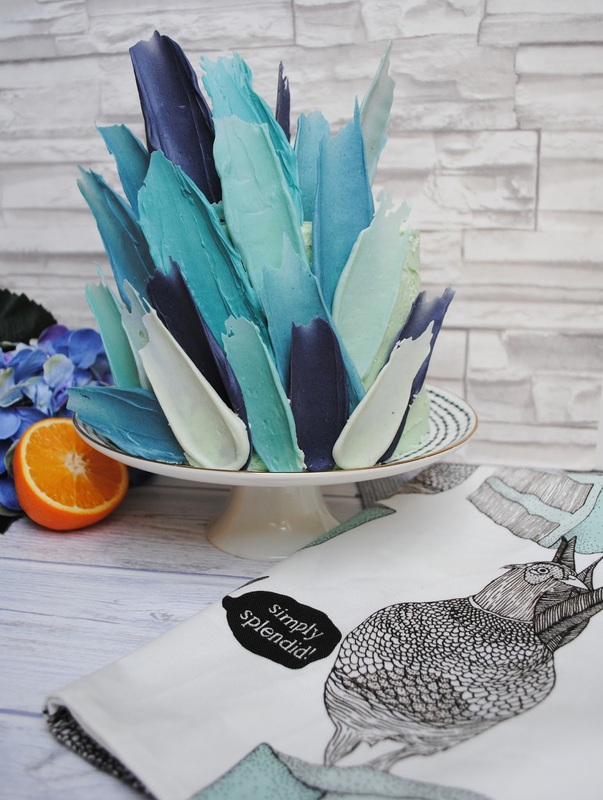 And so inspired by the incredible Pheasant and Blue Cake print we have designed a blue cake of our very own, so read on to see more pictures of these prints and how to make this White Chocolate, Orange and Blueberry Brush-stroke cake. 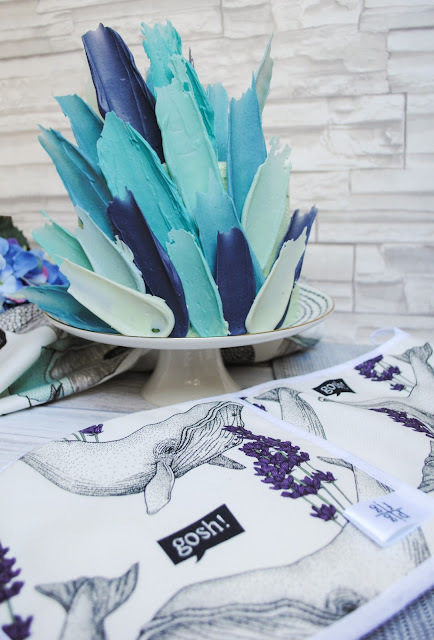 So as we said before, we wanted to come up with a beautiful blue cake to compliment the lovely prints. 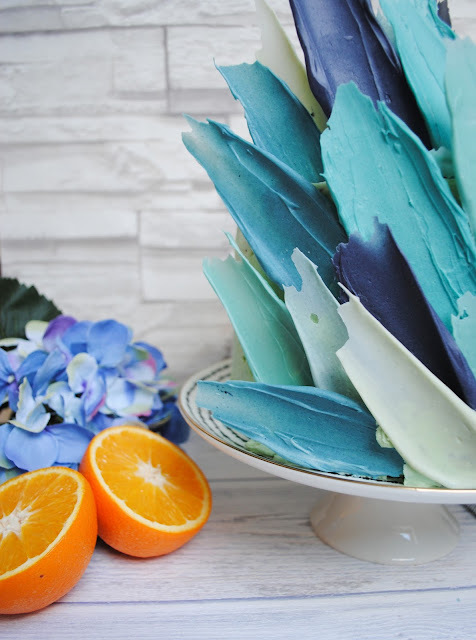 And while this may not be the most conventional flavours for a blue cake, their combined taste is absolutely delicious and we loved the look on our friends faces when they dug into a blue cake only to find it tasted of oranges! 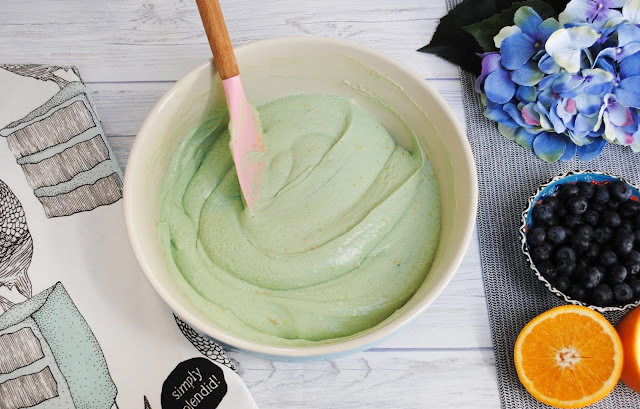 White chocolate and orange has definitely been done before, and we knew that it would be amazing, but the addition of a blueberry filling really brings something different and we love it! 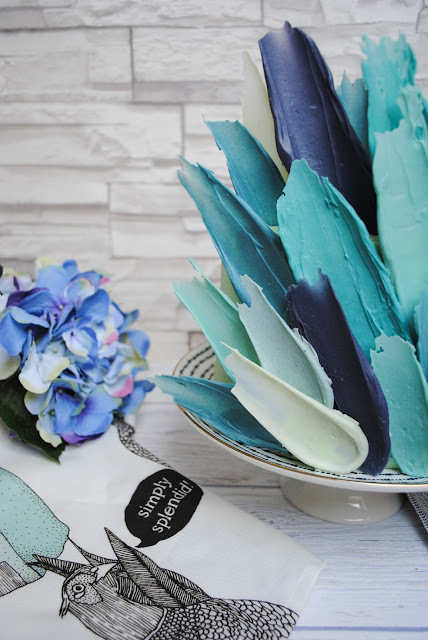 To create the brushstroke decoration, you will need to temper the white chocolate. To do this chop up the white chocolate into small pieces and place about 1/4 into the fridge. Melt the other 3/4 either in the microwave or over a pan of hot water and bring it up to 45°C. When it reaches this temperature, quickly take it off the heat, add your finely chopped frozen chocolate and stir to reduce the temperature down to 26°C as quick and you can. We have found recently that if you stand your bowl of melted chocolate into a bowl filled with cold water (not too cold though), it really speeds up the process. When you have it down to 26°C, you want to bring it back up to 28°C but make sure not to heat it up any higher or you will have to start all over again. 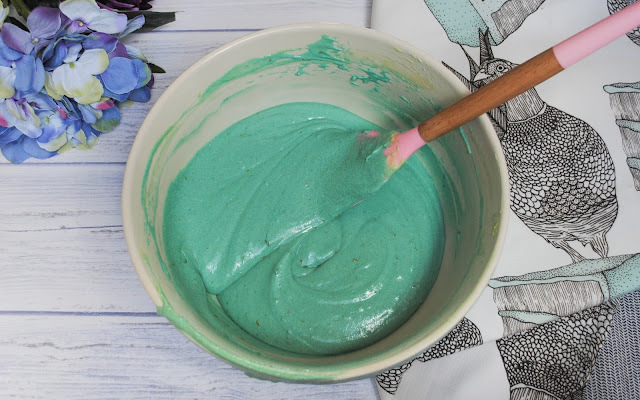 Quickly split the chocolate into a few bowls and get colouring! We just went crazy adding colour on colour to create lots of different shades of blue. 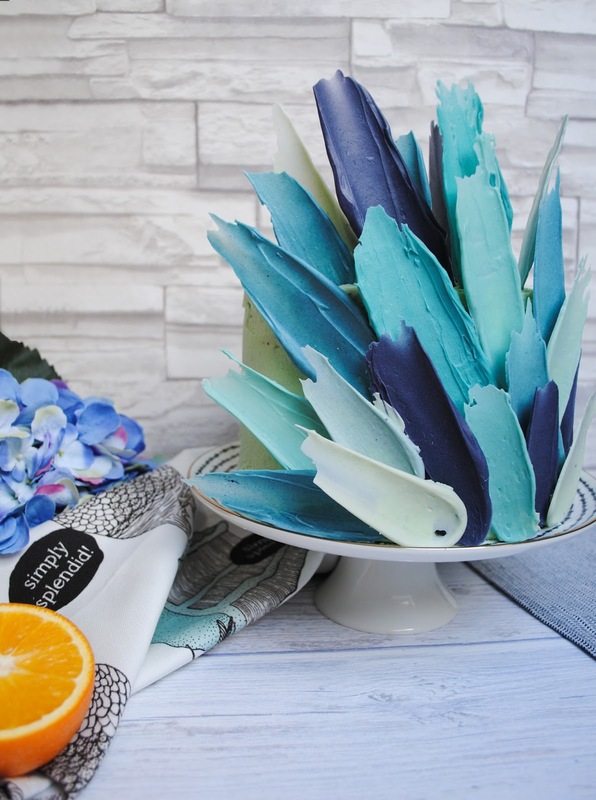 To create these brushstroke-esque shards, spoon a small spoonful onto a sheet of greaseproof paper, and then spread it out using a palette knife (or back of a spoon). Set aside to harden. To make the blueberry filling, place your blueberries, lemon juice and sugar into a pan on a medium heat. 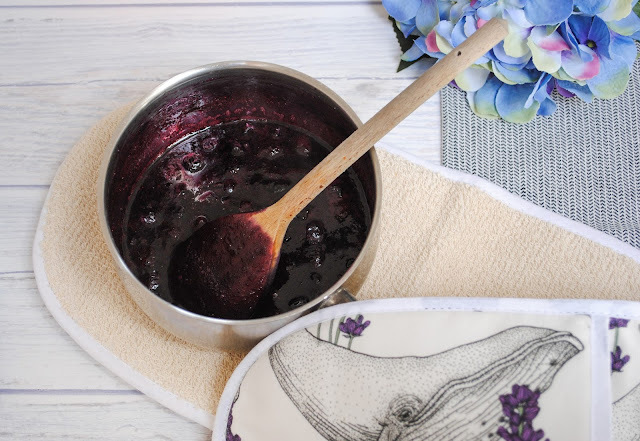 Simmer until the blueberries have become soft enough to mush with the back of your spoon. Then leave to simmer for an additional 15 minutes, until thick and glossy and can coat the back of your spoon, then take off the heat. Leave to cool completely before using! Now onto the main part ~ the cake! 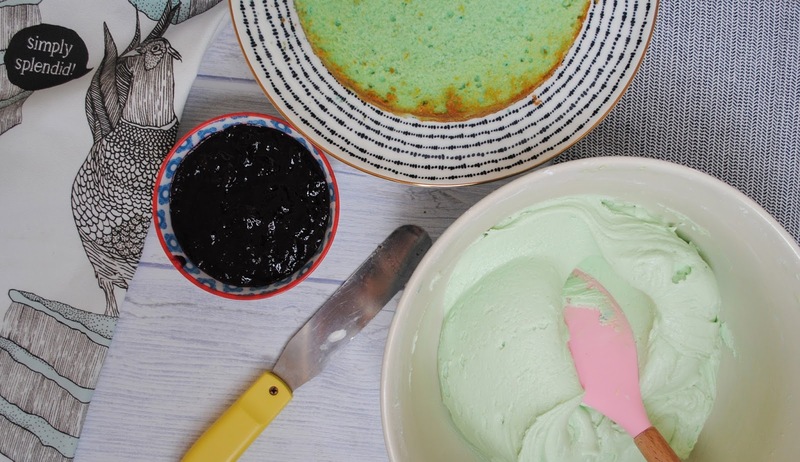 Preheat your oven to 200°C/180°C Fan/Gas mark 6 and line an 8 inch cake tin with greaseproof paper. We currently only have one 8 inch tin but if you have more then that is ideal! To start, beat together the butter and caster sugar until light and fluffy. Then, beat in the eggs. 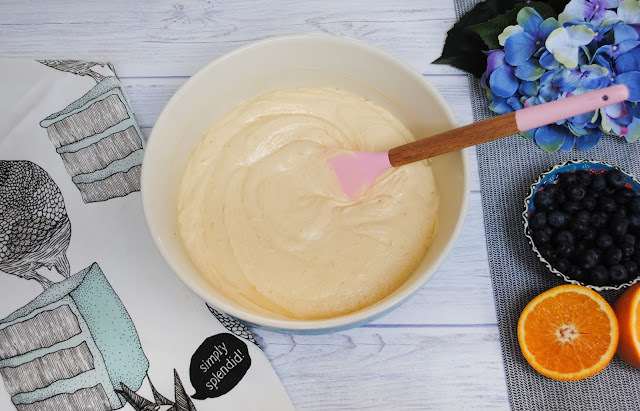 Add in the flour, baking powder, white chocolate and orange zest and juice, and mix until combined into a smooth batter. 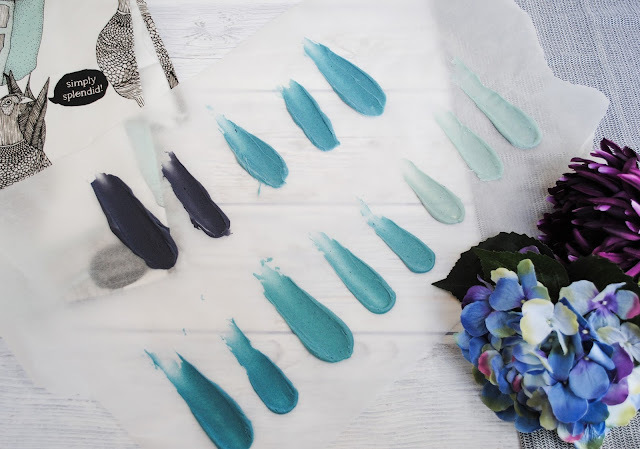 To create the ombré colour effect you will need to create four different shades of blue. Start with the lightest shade and then pour 1/4 of your mixture into the tin. 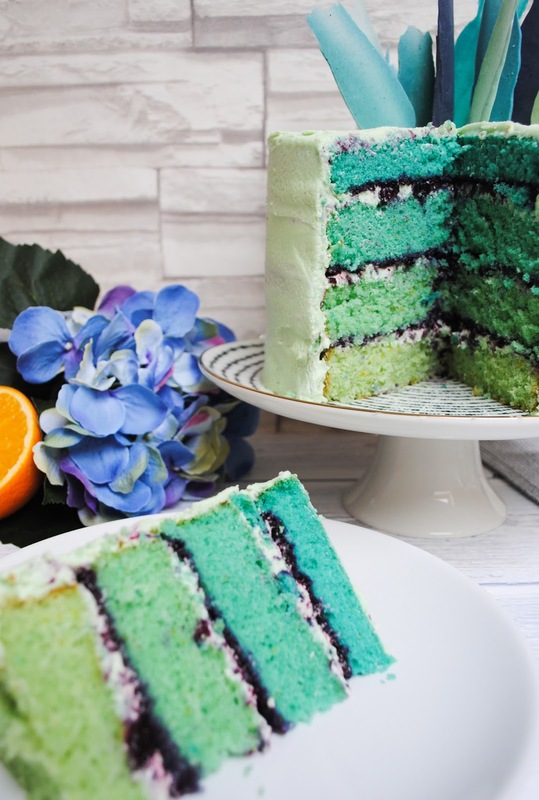 When creating this kind of layer cake, you really need your cakes to bake flat rather than domed. To make sure your cakes rise evenly and come out flat, you can dampen a strip of towel and wrap this around your cake securing with a pin. Bake the cake in your pre-heated oven for around 25 minutes, or until golden brown and an inserted skewer comes out clean. Set aside on a wire rack to cool. 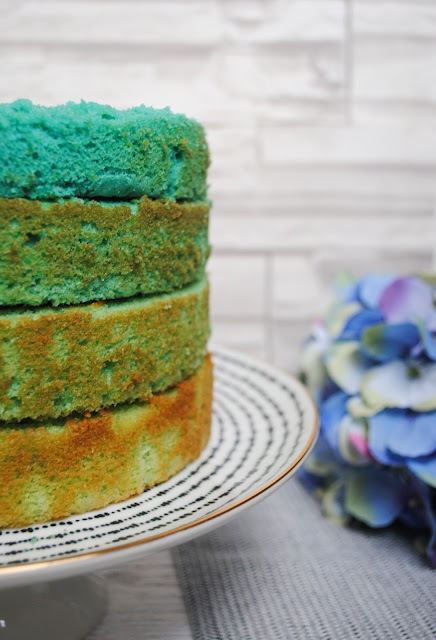 Now that your first cake is out of the oven, add a little bit more food colouring to create a slightly darker shade of blue. Mix well and then bake this cake in exactly the same way as the previous, continuing to add food colouring to the mixture once your next cake is baked. Once all of the cakes are done, leave them to cool on a wire rack whilst you make the buttercream. To make the buttercream, simply beat together the butter, white chocolate and little bit of blue food colouring. Then slowly beat in the icing sugar until you have the right consistency. 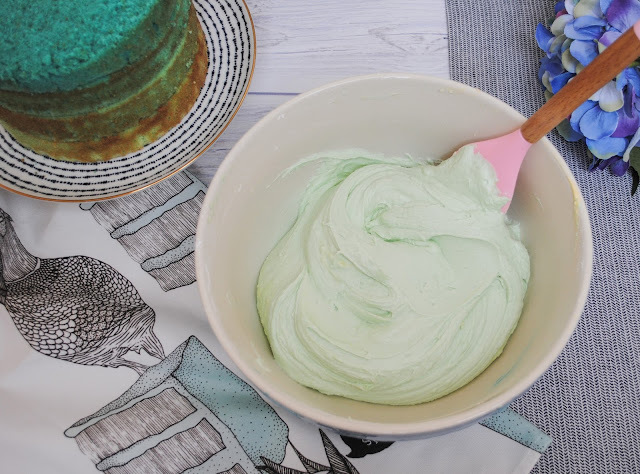 You may need less icing sugar than stated, or you may need more so add what you feel is right for a thick but smooth buttercream. 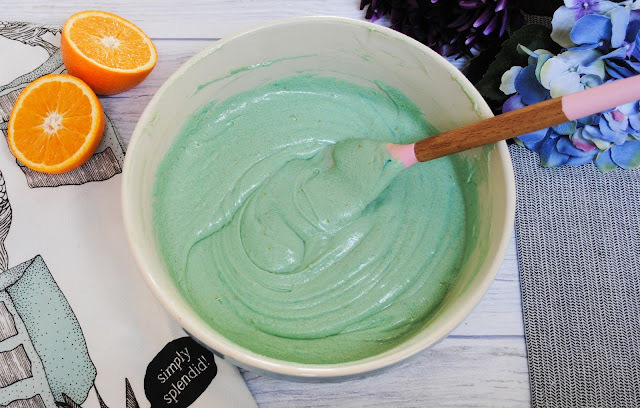 Now that all of the components are ready, it’s time to build your cake! Start with your lightest sponge and build the cake up from there layering sponge then buttercream then blueberry filling, finishing by placing the darkest blue sponge on top. 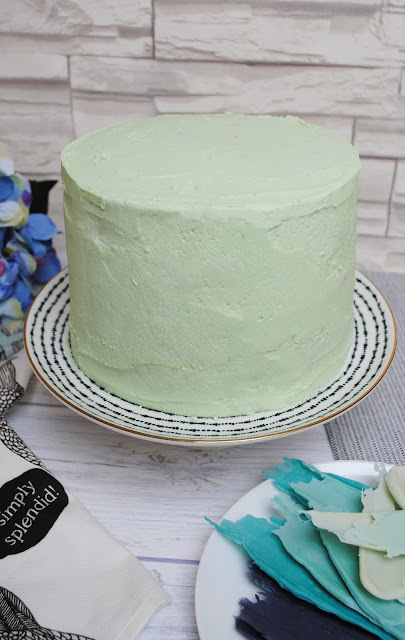 Now you need to cover the cake in buttercream, using a palette knife to smooth a thin layer onto the cake making sure it’s completely covered and as smooth as possible. Leave the cake for around half an hour to let this layer of buttercream set, then you can add another layer to cover up any crumbs or bits of blueberry that might have got into the first layer! Get the buttercream as smooth as you can then you’re ready to decorate with the brushstrokes. 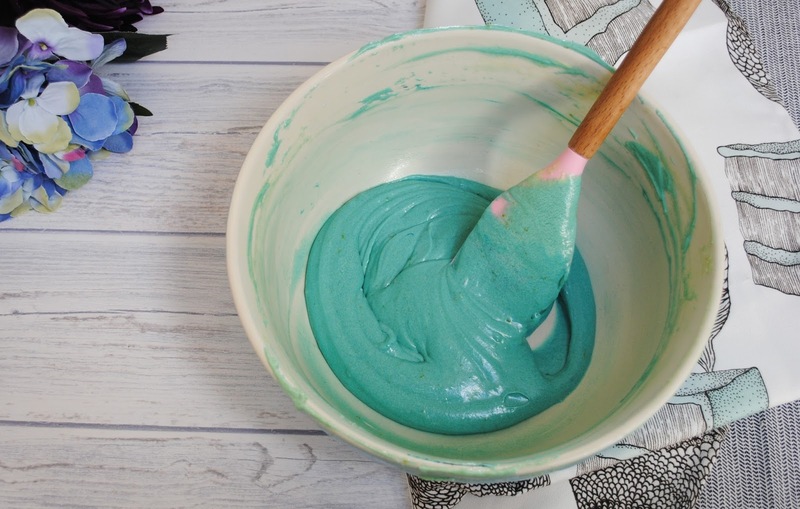 Start with the bigger brushstrokes first and using any leftover buttercream, stick them onto the cake however you would like! We also poked some into the top of the cake too, creating a hole with a knife first before slotting them in (you don’t want to break your chocolate)! 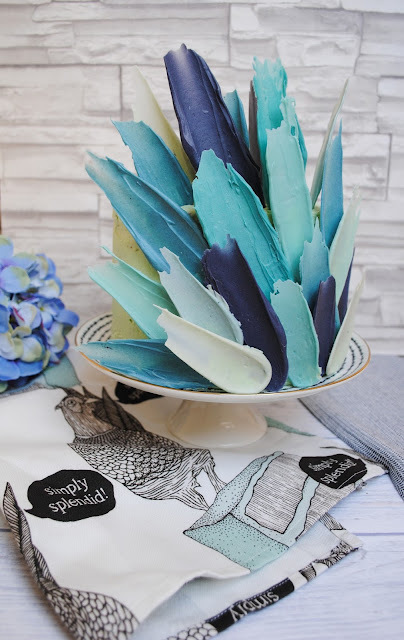 And that is the final cake, inspired by the beautiful Blue Cake and Pheasant design from Pig and Fig. We are so so happy with how the cake turned out, it is definitely an eye-catcher. 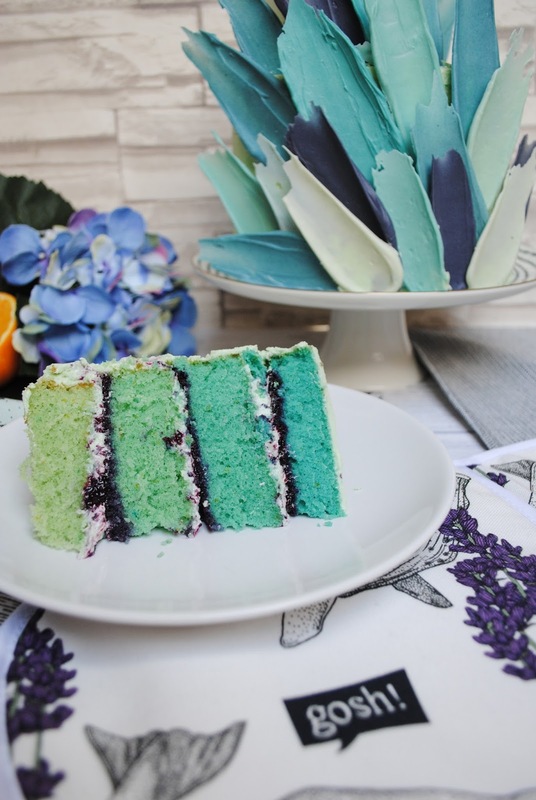 It tastes as amazing as it looks and we will definitely be using these flavours again! 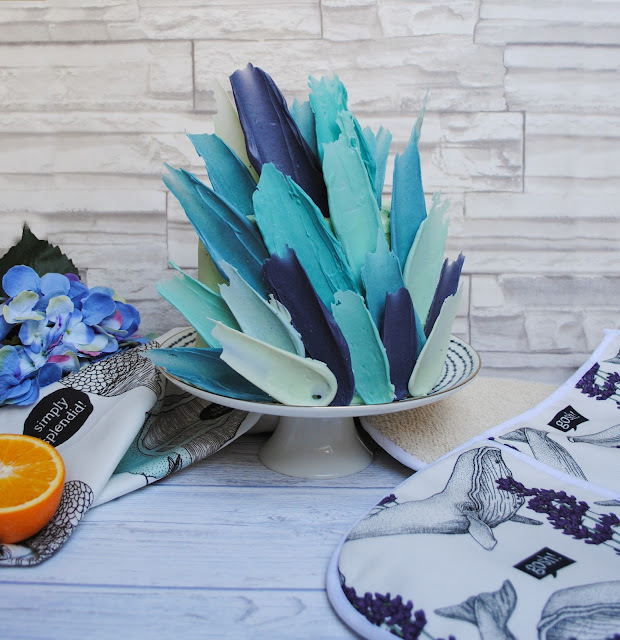 The kick of orange tastes divine next to the white chocolate and the sharp, sweetness of the blueberry filling. 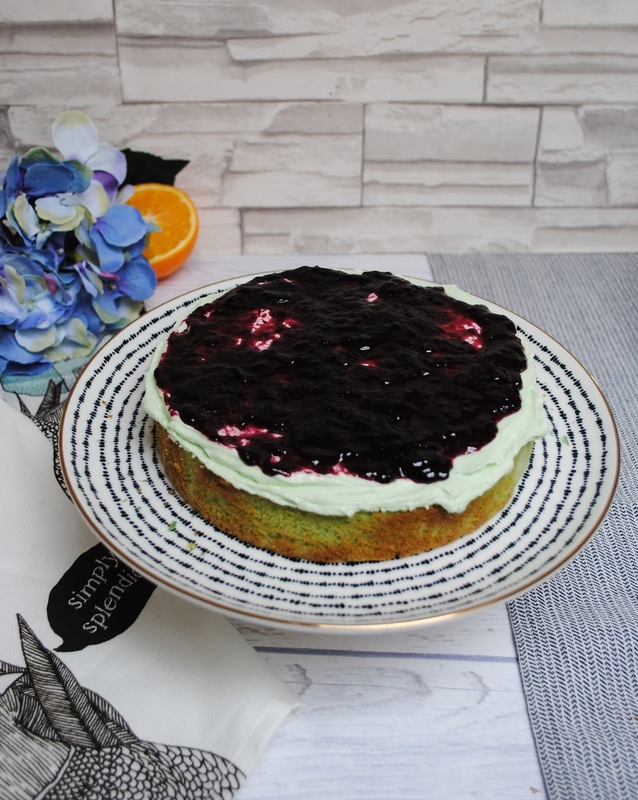 We will definitely put more of the blueberry filling into the cake next time, as it tastes so great and could take more of the intense, fruity, blueberry flavour. Thanks so so much for reading this post, we really hope you liked it! 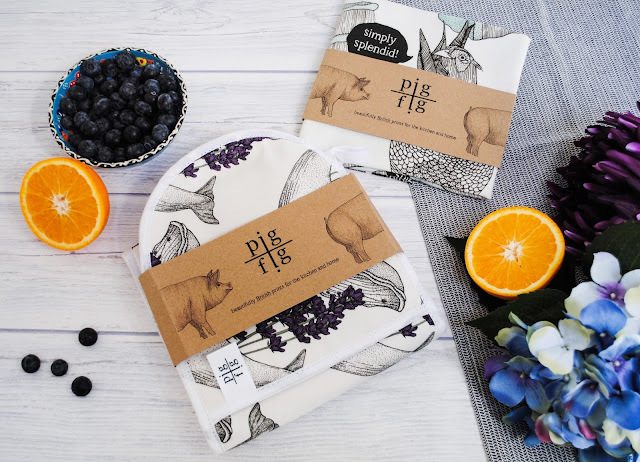 Please let us know what you think of the gorgeous Pig & Fig designs and let us know your favourites! Don’t forget to head over to the Pig & Fig website and Instagram and show them some love! 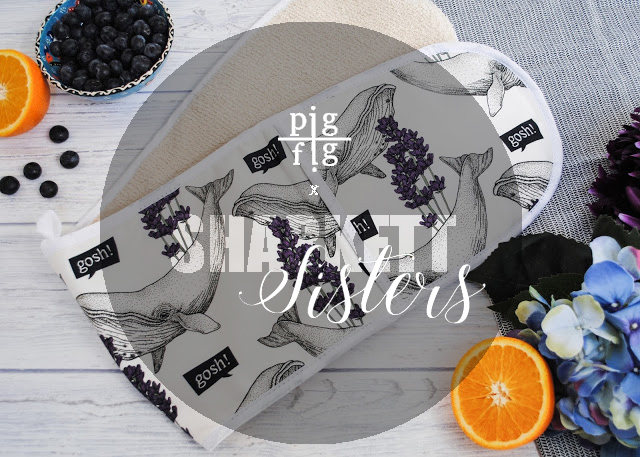 Please follow us on Bloglovin’, Instagram and like our Facebook page ‘Sharkett Sisters‘, if you want to see more of us, and never miss a post. 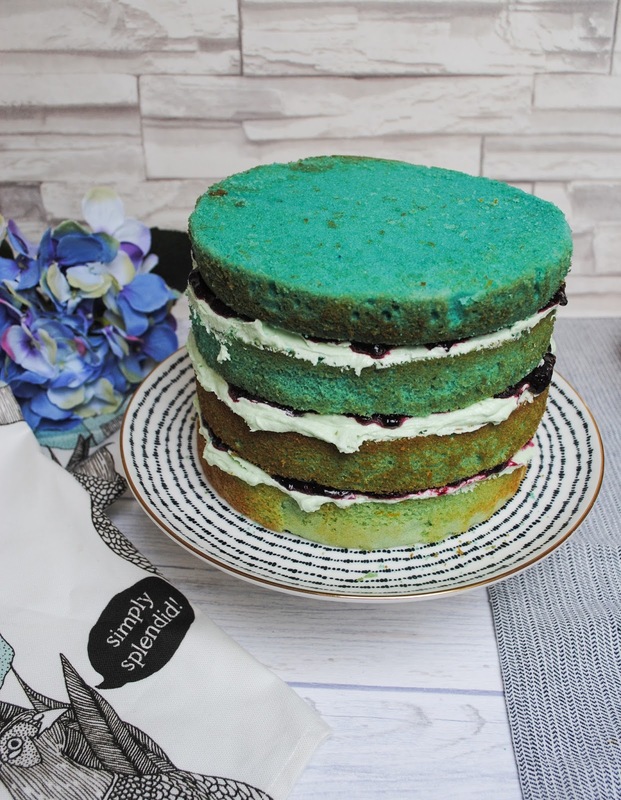 Make sure to check out our Instagram feed and stories, and remember to tag us if you try any of our bakes! We absolutely love seeing them!